The French Champagne region produces only about 8 percent of all the world's sparkling wine, but on New Year's Eve, a disproportionate share of the popping corks will come out of bottles of Champagne. An unusual blend, featuring 60 percent of the relatively uncommon Pinot Meunier grape, this is a fine example of "farmer fizz." 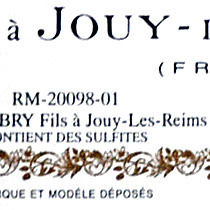 The small-print "RM-20098-01" on this Champagne label reveals that it's a "Récoltant-Manipulant" or grower-produced wine. The French Champagne region produces only about 8 percent of all the world's sparkling wine, but when New Year's Eve rolls around on Monday, a disproportionate share of the popping corks will come out of bottles of Champagne. True Champagne, the hand-made sparkling wine from the rolling, forested region around the cities of Reims and Epernay northeast of Paris, has become synonymous with luxury, a cachet that has placed it in great demand and pushed its price upward. The big-name labels - many of them now under the corporate umbrella of luxury conglomerate Louis Vuitton Moet Hennessy - have become so sought-after that there's serious talk of expanding the boundaries of the Champagne region, taking in vineyards that historically have not qualified for the Champagne label, to increase production. And that's not all that is changing in Champagne. Historically, virtually all the region's sparkling wine has been produced by about 75 "houses" - major companies like Moet et Chandon, Veuve Cliquot, Bollinger and Taittinger and other large firms that boast histories of 200 years or more. But in recent years, a growing number of the more than 15,000 individual growers who traditionally sold their grapes to the major houses have begun using their estate-grown fruit to make their own limited-production Champagnes, grown, made and bottled on the premises. It's a development contemporary with, and somewhat similar to, the increasing popularity of single-malt Scotch, small-batch or single-barrel Bourbon and other artisan liquors, and it appeals in similar fashion to those of us who admire quirky, individual producers who make their product by hand. It's still only a blip on the radar of the world Champagne market: The large houses still produce two-thirds of all Champagne and account for 90 percent of exports. Small-grower Champagnes at most make up 20 percent of sales, the rest being produced by cooperatives. But for many wine enthusiasts, the growing ranks of small producers are where the action is - not to mention the drinking pleasure. U.S. importer Terry Theise, previously best known for German wines, has made a name for himself with a portfolio of exceptional "farmer fizz," as he calls grower Champagne. Looking for Theise's name on the import label is as good a strategy as any for finding excellent grower Champagne in U.S. stores; a slightly more "geeky" technique involves a careful look at the tiny print on the bottom of the label (photo above) to check the so-called "matriculation number," a unique code assigned to every grower by the Comité Interprofessionel du Vin de Champagne (CIVC), the Champagne trade association. If this number begins with the initials "RM" ("récoltant-manipulant" or, literally, "harvester-handler"), you've got your hands on a grower Champagne. "NM" ("négociant-manipulant" ("trader-handler") signifies the larger houses, and "CM" ("cooperative de manipulation") indicates a cooperative. I wouldn't argue that the big-name house Champagnes aren't good. They boast a long and honorable heritage, and they still make their wines the old-fashioned way. But that being said, their large size and corporate management does seem in some cases to inspire a cautious, middle-of-the-road style that yields wines more inoffensive than exciting. I don't find that Veuve Cliquot's Yellow Label and Moet et Chandon's White Star give me the kind of "oh, wow" experience that I'd like to have in a wine at their price level. But I'm just about always willing to give a good grower Champagne a try, when the occasion calls for a popping cork. Here's an excellent example from Terry Theise's collection, just in time for New Year's Eve. Monday, we'll offer another. FOOD MATCH: Although it's fine for sipping by itself as a New Year's toast or aperitif, this quality Champagne with its crisp acidity and full body will work well with a broad range of dishes at the dinner table, from omelets to shellfish, veal, poultry or pork. VALUE: Champagne is not cheap, particularly in the age of the strong Euro, but this one stands well above the competition in the lower $30s. WHEN TO DRINK: Don't worry about stashing it away for a year or two, but non-vintage Champagne is ready to drink when it comes from the store, and does not require further cellaring.